We still need $ 20,812 to achieve our goal for the ABCD 2019 campaign. So far, only 336 families have made their contributions this year. We urge you to please make your pledge today and help us achieve our goal! We want to also thank all those who have already committed, we could not do this without you! Todavía necesitamos $ 20,812 para lograr nuestra meta en la campaña de ABCD 2019. Hasta el momento, solo 336 familias han hecho sus contribuciones este año. Les pedimos por favor hacer su compromiso hoy mismo y ayudarnos a lograr nuestra meta! ¡Queremos también agradecerles a todos los que ya se han comprometido, no pudiéramos lograrlo sin ustedes! The Divine Mercy Novena begins on April 19. It will be in the Chapel at 3:00 PM every day until April 27th. On April 28th, Divine Mercy Sunday, we will celebrate The Hour of Great Mercy at 3:00 PM in the Church. It will be a time of worship and prayer in front of the Blessed Sacrament. La Novena a la Divina Misericordia comienza el 19 de Abril. Será en la capilla a las 3:00 PM, todos los días hasta el 27 de Abril. El 28 de abril, Domingo de la Divina Misericordia, celebraremos la gran hora de la misericordia a las 3:00 PM en la Iglesia. Será un tiempo de oración y adoración al Santísimo Sacramento. Your contribution to the Pontifical Good Friday Collection helps preserve the most significant and holiest places of our faith. However, the grand majority of the funds will go to help the people living in the Holy Land. The economic and cultural situation in Israel is very bad and people can only rely on the Church for support. This collection not only helps our Christian brothers and sisters but also the Muslim and Jewish population by making sure that every individual has the basic human rights of education, food, a home, and more. Tu contibución a la Colecta Pontificia del Viernes Santo ayuda a preservar los sitios más significativos y sagrados de nuestra fe. La gran mayoría de los fondos irán a ayudar a las personas que viven en Tierra Santa. La situación económica y cultural en Israel es muy mala y la gente sólo puede confiar con el apoyo de la Iglesia. Esta colecta no solo ayudará a nuestros hermanos y hermanas cristianos, sino también a la población musulmana y judía, asegurándose de que cada individuo necesitado reciba educación, comida, hogar y más. Come and receive Ethical Catholic information and guidance on life issues from a world-renowned ethicist, Fr Alfred Cioffi. Lecture and discussion on assisted suicide, euthanasia, DNR. Understanding how to meet death with true christian dignity and how to accompany the dying with compassionate love. Next week, we will take up the Catholic Home Missions Appeal. Right now, over 40% of dioceses in the United States are considered mission territory because they are unable to fund essential pastoral work in their communities. Your support of this appeal eases the struggle of these dioceses. Please prayerfully consider how you can support this appeal. La próxima semana realizaremos el Llamado para las Misiones Católicas. En estos momentos, más del 40% de las diócesis en Estados Unidos es considerado territorio misionero pues no le es posible financiar las labores pastorales básicas en sus comunidades. El apoyo que usted le dé a este llamado aliviana los esfuerzos que hacen estas diócesis. Por favor, en oración, considere la manera de apoyar a este llamado. 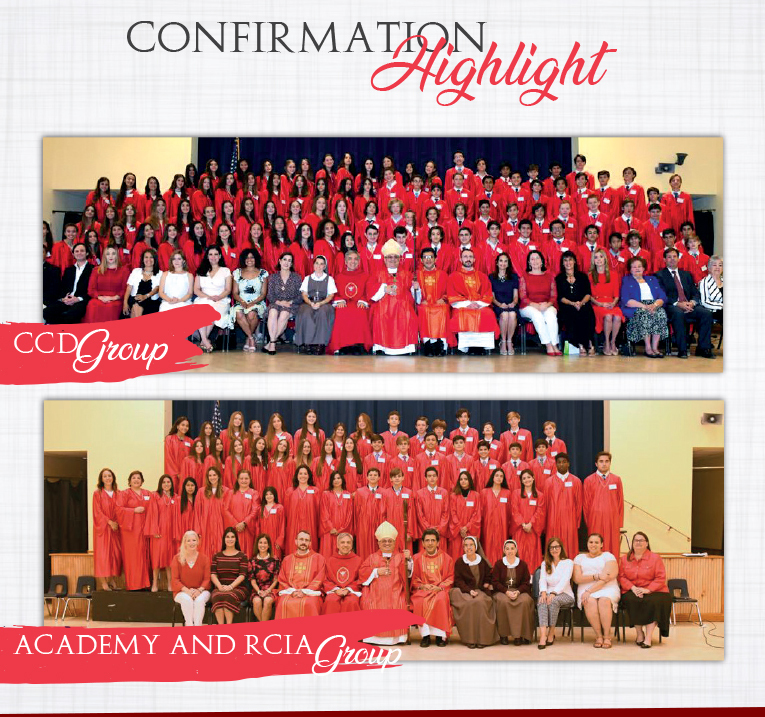 Congratulations to the youth people and RCIA group who were confirmed on Saturday, April 13! Our Church is renewed with the gift of the Holy Spirit and y their response to the Lord’s calling to be his disciples. To Bishop Enrique Delgado who came to confirm them, to all parents, sponsors and friends who have walked with them on their faith journeys. Our especial Gratitude to our Confirmation catechists who generously, patiently and lovingly accompanied them during the two years preparation. Ketty Gomez, Joan Lahowin, Alejandro Servalli, Juana Keller, Monica Salazar, Carmen Massiani, Danielle Stiglich, Gonzalo Lauria, Claudia Yidi, Maria Angelica Davila, Fernando Gimenez, Alfredo Ruiz, Maria del Carmen Errazuriz, Cristina Sammataro y Krista De Castro. Academy Religious teacher, Sister Michelle, sctjm, and RCIA team Dcn. Adrian Zapatero, Linda Chehab and Ana Roman. Thank you! May the Lord bless you and give many fruits to you sowing. The last Sunday of each month we will be giving a special blessing to married couples celebrating a wedding anniversary during that month. Please join us on your wedding anniversary month! El último domingo de cada mes, daremos una bendición especial a aquellos matrimonios que estén celebrando su aniversario de bodas durante ese mes. Les invitamos a que nos acompañen el mes de su aniversario! Middle School Students, If you want to have an amazing time and deepen your relationship with God and friends reserve the date May 4th, 2019 for the next Middle School Retreat - Totus Tuus - at St. Agnes. You cannot miss that. Emmaus Men Ministry of St. Agnes Church invites you to live an amazing encounter experience! The Archdiocese of Miami has been hearing reports of people receiving text messages and emails from scammers impersonating clergy, asking for gift cards from Amazon and other retailers. If you, your friends and family receive text messages or emails like this, please do not respond or buy the requested gift cards. Clergy would not ask for gift cards. You can report the scam to Florida's Consumer Protection Division, by going to www.myfloridalegal.com and filling out a complaint form, or calling the Fraud Hotline, 1-866-966-7226. 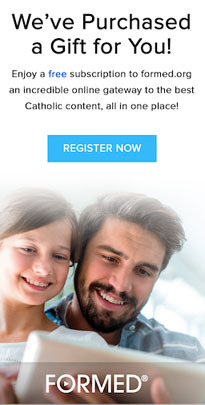 We're pleased to announce that St. Agnes Catholic Church now provides online giving through software called ConnectNow Giving. When you participate, your gift will transfer directly into the parish bank account. And you won't have to remember to write a check or stop by the ATM on Sundays! Click on the tab ''New User Registration''. This is a convenient and safe way to make a one-time or recurring donation. Nos da mucho gusto anunciar que St. Agnes ahora ofrece programas de donaciones en línea a través de un programa llamado ConnectNow Giving. a no tendrá que acordarse de escribir un cheque o pasar por el cajero automático el domingo. ¡Empezar es fácil y conveniente! Haga clic en la pestaña "New User Registration"
Esta es una forma conveniente y segura de hacer una donación única o recurrente. Que es la felicidad? En la vida? Que nos hace felices? Depende de la buena o mala suerte que tengamos en la vida? Depende de lo que hagamos o dejemos de hacer? La pregunta que Jesus dirige a sus amigos: Que buscan? Nos cala hondo... también su respuesta: Vengan y Vean!!! Find out what we are going to see and share with your friends! In honor of Our Blessed Mother, the Respect Life Ministry is sponsoring a ''Baby Bottle Campaign'' to support our South Dade Pregnancy Help Center which provides assistance to pregnant mothers and their babies. The Campaign begins on Saturday, April 27th and ends on Mother’s Day, Sunday, May 12th. Baby bottles will be available for pick-up after each mass the weekends of April 27th-28th and May 4th-5th. Please fill up the bottles with bills or checks - write a check if you want your donation to be tax deductible. (Checks must be payable to Respect Life). Baby bottles must be returned to the front desk of the Pastoral Center which is open from Monday - Friday, 8:30 AM to 4:00 PM The last day to return the baby bottles is Tuesday, May 14th. This is our Parish’s Pro-Life Pregnancy Help Center, so let’s support it and make a difference in a baby’s life! The TRUTH is like a fresh dawn that illuminates our dark culture. Come and hear the glorious truths of our human nature and the way God calls us to live nobly, in fullness of JOY. Come and join our free lecture series. April 25th | End of Life: Suicide, Euthanasia and DNR: Death with Christian Dignity. May 16th | Speaking for the Unborn: Pro-life Answers to Pro-choice Arguments. Sponsored by the Saint Agnes Respect Life Ministry. To support "pizza time" for the Youth Ministry, contact Fr. Foltyn or Martha Poulat. The next regular meeting for Middle School will be after Easter on April 26th at 4.30 PM (as usual) at Albertson Hall. Be on the look out! Middle School retreat is coming up on May 11th! youthministry@stagneskb.org | Instagram: stakbyg | Twitter: @stakbYG | Youtube: St. Agnes Youth Ministry | Facebook: @stakbYM. Please prayerfully consider spending an hour a week with Jesus in the Blessed Sacrament Chapel. Por favor considere pasar una hora semanal en oración con Jesús en la capilla del Santísimo Sacramento. Since 2002, the Catholic Church in the U.S.A. has followed a set of rules initiated by the bishops of the country and approved by the Vatican for dealing with sexual abuse of minors by priest or deacons: The Charter for the Protection of Children and Young People. In the Archdiocese of Miami, the policy includes vulnerable adults. Every U.S. diocese/eparchy must meet a specific set of requirements. We will share a couple of them each week throughout April during Child Abuse Prevention Month. The Archdiocese of Miami is in compliance and has been each of the 17 years since the inception of the Charter. To establish a review board of at least five persons, mostly members of the laity, who counsel the bishop on allegations and review local policies dealing with sexual abuse of minors. To protect the rights of the accusers and of the accused.